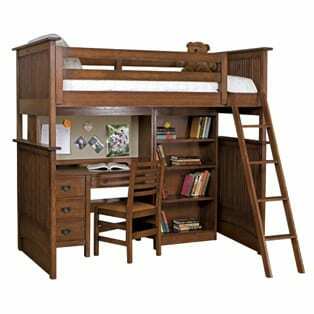 New to the Stickley Furniture collection of traditional American furniture is this all in one bunk bed / student desk combination. I cant believe all of the things they combined into this one stellar set. I think any child would love it for its appearance that places the bed on top and creates nice work station The useful layout works well with “small space” situations and incorporates everything your child could want or use in a fort like layout. This Stickley Furniture handy combo includes a bookcase, drawer unit, study desk and hutch with a peg board with a twin bed and ladder made from solid Oak. I may be a long way past my bunk bed stage but even I know this qualifies as cool. If you are looking for the perfect furniture for your child’s bedroom you should look at these 15 Bunk Beds with Stairs that are simply amazing and break away from the traditional style we see some often in department stores.